If there’s anything that captures the imaginations of people young and old, it’s the idea of finding buried treasure. There’s the thrill of following a map and the wonder of seeking out the unknown. Even when the treasure is a bit smaller than pirate’s booty, kids love finding whatever is hidden at the end of their hunt. 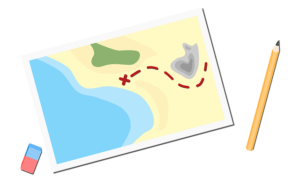 You can easily put together your own treasure map for a grand adventure. It can involve physical challenges, understanding a map, reading/word puzzles, math, and logic, so it’s just as educational as it is fun. The ages and abilities of your kids will help determine if the treasure hunt should take place in your living room, your backyard, or the whole neighborhood. Find a spot for your treasure that will not be disturbed by anyone else passing by and make sure the treasure is appropriately protected from the elements, if necessary. Keep safety in mind as you choose a route so kids don’t end up in a real adventure situation! Start walking the route, drawing and taking notes as you go. Count the number of steps from location to location, keeping in mind that your child will have a shorter stride than you do. You might give fun hints like, “10 giant steps” or “4 leaps” from one spot to another. Make note of landmarks along the way and ensure there are lots of stops so kids don’t have a chance to get off track. You might want to include physical challenges, like knocking down a pile of blocks with a bean bag, or hitting a target with a Nerf gun. These help prolong the fun, while getting kids to be active. You can even tie it into the theme, such as crossing monkey bars over a pit of dangerous crocodiles. It’s time to draw your treasure map. Include all of the elements you planned, using a dashed line to mark the route. Add in the landmarks, puzzles, and obstacles and include a Compass Rose and a key so they know what each symbol represents. Set up any props you need along the way, hide your treasure, hand them a compass, and set them on their way! If your kids love searching for treasure, they’ll be thrilled with the Club SciKids Dallas Sea Adventures summer camp. They’ll learn all about making maps and orienteering, pirates, and the creatures of the deep. Your kids will learn new things, make new friends, and have a blast along the way. They might just make a treasure map for YOU to follow!